I have a 2014 Malibu MXZ that the former owner intended to put some set of flooring in, but never got around to it... I know this topic has been discussed infinitely, but was going to get some feedback. Is it worth the extra 400+ to get it custom built for your flooring vs just getting the sheets off of Amazon. I dont see a group buy any where and does Gatorstep ever have any sales? The GS buy is closed, but I am digging mine. If you go that route, template your own boat so you will get something that fits exactly to your floor plan. I used a GS template that some other owner sent them which was probably as close as you can get to my layout but.... 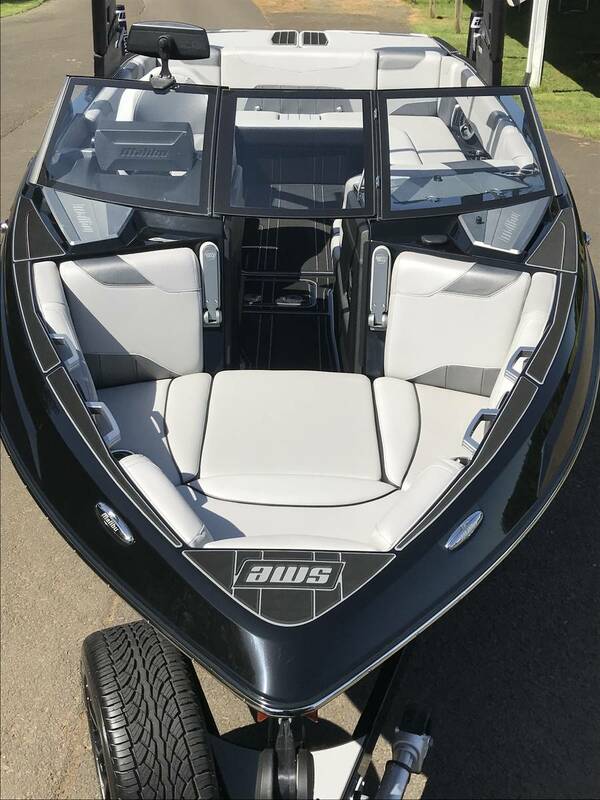 The problem is there are too many variables between boats to be an exact match and I did have a couple issues that I would not of normally been happy with had I not gotten the 30% discount. Overall GS was still very good to work with to fix some of the issues I had so I can’t complain. Love my Gatorstep, and they’re also a great local business around here. The black floor has actually been cooler than the lighter colored seats. I get the same. We had someone walk over from our boat, and said "oh don't step on the black pad, it's probably hot" then proceeded to step on the vinyl and scream. Gotch'ya! As far as is it worth the extra $400? ... that’s solely up to you. Do you have time to make a project out of this instead of a quick install? If you have the time do you care to take on a project? Or do you value your time at $400 or greater and just order the kit for a quick install? There are a lot of options I checked on our build because right now my time is invaluable and if I have time I’d rather be on the water over doing a project on the boat. And I love boat projects. You could look at hydro turf too. That’s what I did in ours, turned out good for me anyway. We have a very energetic 3 year old Golden Retriever who loves doing laps up and back in the boat! He gets crazy excited when boating. I was real worried the Gator step would get ripped up. At times he tries to run laps in the boat making lots of quick cuts and pivots back and forth. Figured if the Gator Step did get damaged I could replace pretty easy. The flooring has taken his antics so far without a problem. No rips or tears at all! He also likes to try and dry himself off on the carpeted walls using his claws pushed into the gator step. Discourage this behavior but he persists. Again no permanent damage. The Gator step temporarily indents then returns back to normal shape. We do keep his claws well groomed so they are not super long which helps. Been very impressed with the Gator Step durability. Easy to keep clean, holding up to the traffic and the dog. Cleans up using a soft scrub brush, soap and water. Love it! 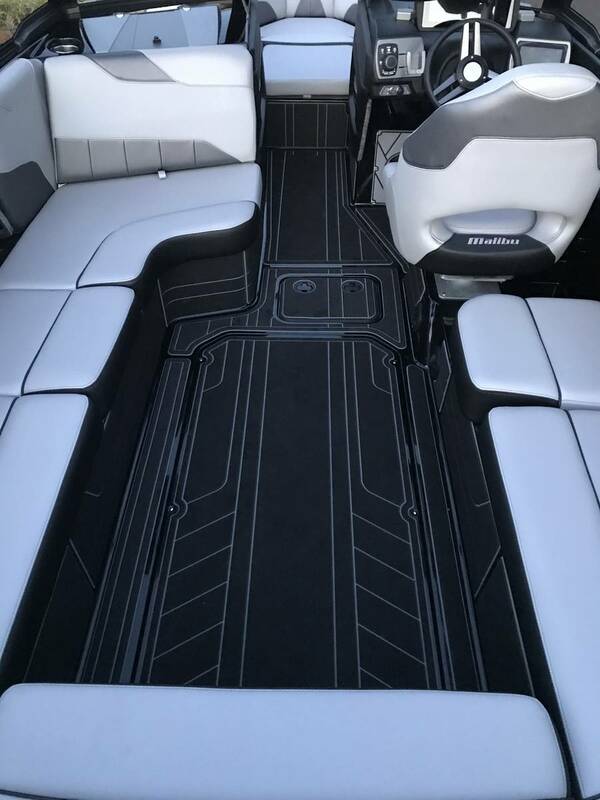 We went with the Scraped Silver Cloud Top and Bottom using the Cascade Graphic pattern on the floor, transom/walk, storage.